(MENAFN - SomTribune) Thirty years ago, the US-backed Somali government slaughtered an estimated 200,000 people. Now survivors want US to help to uncover the crimes (Somaliland's Forgotten Genocide). On a hot and humid June afternoon, a group of boys wearing FC Barcelona jerseys kicked around a soccer ball in the Malko-Durduro, a dry seasonal river on the outskirts of Hargeisa, the capital of the breakaway territory of Somaliland. At first glance, the flat, red earth of the riverbed made for a typical improvised pitch in this arid region. But recent heavy rains had exposed what had earned the area the moniker 'the Valley of Death.' Around them, human bones protruded from the ground. But these kids had grown up playing soccer surrounded by skeletal remains; they hardly noticed them. This year marks the 30th anniversary of what is often called the 'Hargeisa Holocaust,' when about 90 percent of the city was destroyed and tens of thousands of Isaaqs were killed. Yet there are no major plans to mark the horrors in Somaliland, or anywhere else for that matter. In the past, a few international organizations have recognized the bloodletting. A 2001 UN report investigating the attacks against the Isaaqs concluded that 'the crime of genocide was conceived, planned and perpetrated by the Somalia Government against the Isaaq people of northern Somalia.' But the events have been mostly forgotten; the boys playing soccer did not know the story behind the bones. Even in Hargeisa, many people don't realize the extent of US support during the genocide. No American has ever apologized for what happened in Somaliland; there has been no internationally backed Truth and Reconciliation Commission, and no one has been criminally punished. There is little funding to investigate—let alone prosecute—the perpetrators. And some of the Somali genocidaires now have close ties to the US-backed government in Mogadishu of President Mohamed Abdullahi Mohamed, known as Farmajo. The country of Somalia was formed in 1960 when British Somaliland gained its independence from Britain and joined with its much larger neighbor to east and south, Italian Somaliland. Nine years later, General Siyad Barre took over in a bloodless coup and steered the young country toward the Soviet Union. Somalia was strategically placed along Africa's longest coastline, and the Soviets welcomed a new proxy in the Horn of Africa. This all changed in 1977 when Barre invaded the Somali-majority Ogaden region of southeastern Ethiopia. Previously Ethiopia had been aligned with the United States, but after the Derg military junta seized power in 1974, the Soviets had begun supporting Somalia's communist neighbor. Forced to choose between allies, the Soviets sided with the Derg junta, and sent arms and military advisers. Cuba's Fidel Castro provided an additional 13,000 troops, and Ethiopia repelled the Somali army in 1978. Livid at the Soviet support for Ethiopia, Barre switched sides, allying himself with the United States. In January 1981, former US secretary of state Henry Kissinger visited the presidential palace in Mogadishu, hoping to further strengthen US-Somalia ties. Barre had criticized President Jimmy Carter for not backing his country against the Soviets. But now Kissinger was convincing President Ronald Reagan to view Somalia as a crucial theater for US-Soviet confrontation. A year later, Barre made the trip to Washington, DC, to meet with Reagan in the Oval Office. Grainy footage of the encounter shows Barre asking Reagan for help. 'Somalia is not afraid of any other country in the region, but it cannot cope with a superpower like the Soviet Union,' he told Reagan. Barre said the United States agreed to help Somalia because it 'is also in its own interest.' In the 1983 budget, Reagan requested $91 million in military and economic assistance for Somalia, plus another $18 million in food aid for refugees. That year Somalia's entire GDP was less than $750 million. Manafort did PR for Barre even as he was massacring the Isaaqs. Levinson said Manafort sent her to Somalia to have Barre sign a contract for $1 million. 'Our assignment would then be to clean up Siyad Barre's international reputation, which needed plenty of soap,' she wrote in The Washington Post in 2017. With Manafort's PR work and the country's anti-Soviet Union alignment, the United States was happy to turn a blind eye to Barre's abuses. By 1988, Washington had given his government hundreds of millions of dollars of military and economic aid, and Barre had become entirely dependent on US support. Barre had long targeted and discriminated against the Isaaq tribe, and so in 1981 in London, Isaaq dissidents formed the Somali National Movement (SNM) to overthrow Barre's rule in the north of the country. Barre responded to this insurgency with a ruthless military campaign. In 1988, Amnesty International reported that the Barre regime used 'widespread arbitrary arrests, ill-treatment and summary executions' and torture of those suspected of collaborating with the SNM. They found that those who opposed the Barre regime were gathered, bound, and taken to places like the Valley of Death where they were shot and buried in unmarked graves. One of the most brutal parts of the genocidal campaign was the destruction of Hargeisa, the largest city in northern Somalia. In May of 1988, Barre's regime sent in fighter jets to level the city. The destruction of Hargeisa was so total that it earned the nickname 'the Dresden of Africa.' Bombing missions and ground troops attacks killed more than 40,000 people. Burao, the third largest city in Somalia at the time and the second principal city in northern Somalia, was razed. The relentless violence against Isaaq civilians in 1988 resulted in the world's largest refugee crisis. More than 300,000 refugees fled to Ethiopia, most of them arriving in the small border town of Harta Sheikh in Ethiopia, which became the largest refugee camp from 1988 until it closed in 2004. He paused and then said, 'The US was not directly involved in the inhuman treatment of the people of Somaliland, but, like many other allies of the regime then, of course, their hand was there.' The US mission to Somalia did not return a request for comment. The United States knew what was going on and maintained its support. A cable released by Wikileaks from that period and sent by the US embassy in Mogadishu noted: 'Many displaced persons (i.e. Isaaqs) would have returned home long ago had they not been deterred from doing so by…government forces.' The cable continued: 'Isaaqs, suffering from thirst, hunger, disease, and abominable camp conditions, were demanding to go home.' There was no discussion of cutting support for Barre as the genocide unfolded. But as the United States ramped up its bombing campaigns in Iraq and the Cold War ended, the United States eventually decided to redirect its resources from Barre's government to the Middle East. Without US support, the government of Somalia collapsed. For survivors like Yusuf Mire, the trauma depicted on the murals is still fresh. During a crackdown in 1988 by Barre's forces in the city of Burao, Somali troops hacked off his left arm and abducted and killed his family. Mire has dedicated his life to uncovering the truth of what happened in the Valley of Death. He works with survivors and families of the disappeared, helping those who, like him, had loved ones that never returned from Barre's killing fields. Mire told us that the United States is simply not interested in digging up the past or funding forensic investigations in Somaliland. Given the US role, he said it would prefer to prop up the government in Mogadishu and for the truth to remain buried. Ismail Abdi is another survivor who works with vulnerable children in Somaliland for a British humanitarian NGO based in Hargeisa. As a young teen, Abdi ended up at the Hargeisa Orphanage. Then, in May 1988, from the orphanage window, he watched Barre's military personnel execute a family; he still remembers the screams of dying children. Abdi sent us a photo taken by a Dutch woman who had worked at the Hargeisa Orphanage in 1988. The photo, which Abdi asked us not publish, showed the bodies of a woman and her children covered in blood. We met him in the garden of a swanky hotel in the center of Hargeisa; men sat nearby on plastic chairs eating goat curry and drinking mango juice. Abdi lamented that young people now do not know what happened, and said he wants 'justice for our people.' Abdi said he wants the evidence he has collected about this one family to be used to bring those responsible to justice. But like most Somalilanders, he does not have the money to pursue those responsible in the courts either internationally or in Somaliland, a country that does not officially exist. But there is an organization Abdi is hoping can help bring those responsible to justice. In the mid-1990s, Somaliland's first president, Mohamed Haji Ibrahim Egal, established the Somaliland War Crimes Investigations Commission to find and unearth the mass graves, offer proper burials to victims, and bring the judicial action against those responsible for the killings. The US government has offered no help. Ahmed said he's upset that the United States and other Western powers have taken so little interest in the genocide: 'As Somaliland Republic, we are expecting to hear from the UN to establish a tribunal like Rwanda.' But their requests have been met with silence. Ahmed said that many of the killers are now hiding in plain sight in the United States, Kenya, Canada, and elsewhere. Because it's not a recognized state, Somaliland does not have the power to push for a UN-backed war-crimes tribunal, like in Yugoslavia or Sierra Leone. As time passes, evidence gets lost. In the Valley of Death, rainfall reveals new skeletons, but it also erodes and washes away the bones. 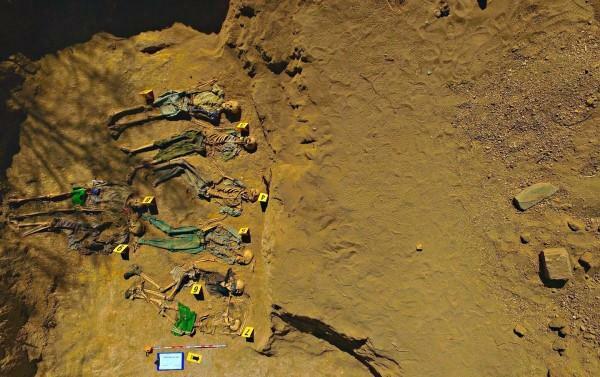 Thankfully, while the US government has not provided any support, the San Francisco–based Center for Justice and Accountability (CJA) has stepped in, and introduced the commission to the Peruvian forensic anthropology team Equipo Peruano de Antropología Forense (EPAF), led by Franco Mora. Since 2012, EPAF has been excavating the mass graves in the Valley of Death and other parts of Somaliland, identifying and recovering as many bodies as possible. They are also helping the commission provide proper burials. 'Our work is only humanitarian; we try to recover and identify the disappeared and to bury them with dignity,' Mora told us. Ahmed said that the commission has to pay the EPAF to dig up the graves, but complained that the Somaliland government can only afford to do this, at most, twice a year. With an estimated 200 sites, 'we don't have the capacity to carry out the work ourselves,' he said. The commission hopes the remains unearthed by the EPAF team can be used not only to get a better idea of what happened, but also as evidence to convict or hold genocidaires accountable. But this will be tough. Mora said his team is only, 'recording the injuries and establishing the most probable cause of death.' He said to establish a legal case you would need not only information retrieved from the bodies and graves but also historical information and documentation, which is nearly nonexistent because so many government records were destroyed during the war. The only reliable documents about the Barre regime's genocidal campaign are held by countries like the United States or international human-rights groups. In 2016, a CNN investigation publicized another Somali who arrived in the United States after allegedly participating in the genocide. Yusuf Abdi Ali stands accused of committing war crimes while a colonel in Barre's regime during in the 1980s. He was head of the Somali army's Fifth Brigade, which is said to have tortured clan members and burned down villages. For 20 years, he had lived near Washington, DC, and worked as a security guard at Dulles Airport (he was suspended after his identity was revealed). The CJA brought a lawsuit against him in 2004. The CJA is representing Farhan Warfaa, who was nearly killed by Ali during an interrogation in 1987. In a 2016 ruling, the Fourth Circuit court dismissed Warfaa's claims of war crimes and crimes against humanity, but upheld claims of torture and attempted extrajudicial killing. In June 2017, the Supreme Court allowed the CJA to continue pursuing Warfaa's claims under the US Torture Victim Protection Act. But the US government has not been as keen as the CJA to help. Ali's background had been revealed as far back as 1992 when Canadian broadcaster CBC News uncovered that he had worked as a security guard in Toronto after fleeing Somalia in 1991. The US authorities knew his record but nevertheless did not prevent him from settling in the United States and living for decades a suburban American life. Of course, not all the Somali perpetrators headed to the United States. Last year, General Mohammed Said Hersi Morgan was filmed watching Farmajo's presidential inauguration in Mogadishu, apparently as a guest. Morgan, known as the 'butcher of Hargeisa,' has lived freely in Kenya since the collapse of the Barre government in 1991. Many Somalilanders hold him responsible for carrying out the Isaaq genocide; in 1988, he's reported to have ordered his troops 'to kill all but the crows.' Yet he still gets invited to political events in Mogadishu.